Remember the Joni Mitchell song? was a song outside my window and the traffic wrote the words..."
It was freezing - around zero - on Church Street in downtown Burlington early this morning. 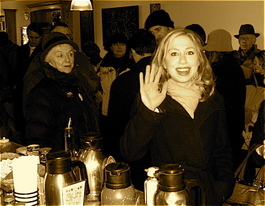 At 9:15 AM when it had been broadcast Chelsea Clinton would arrive on Church Street to shake some hands, there were 250 people huddling in the cold hoping to meet and greet the famous daughter of Bill and Hillary. "We want to see the Clintons, any Clinton we can," said Connie Ramsey of Burlington. "I'm supporting Hillary, but I’ll take either one, her or Barack." Is it because she’s a woman? "No," replied Ramsey. "I find that insulting, actually, that people assume if you’re a woman you’ll back the female candidate." Different story for Valerie Parauka from St. Albans. "I’m voting for Hillary because I want to see a woman in the White House," Parauka told us. "I think she’s capable. I think she’s more capable that Barack. She has the experience and the strength to deal with our country and other countries." Is her gender a key factor? "It shouldn’t be a factor, but unfortunately in today’s society, it is a factor," said Valerie, "and people do look at her gender and she has to work twice as hard to overcome that. I think it’s time for a woman president and I think after Bush’s fiasco, it’s a prime opportunity for her to pop into office." The crowd has shrunk by the time Chelsea arrived around 10 o'clock. She was escorted by former Gov. Madeleine Kunin and Big Bill's EPA Secretary Carol Browner. The First Daughter hit Uncommon Grounds for some java. Dropped into Banana Republic, too. Well, at least she had one parent get elected president of the United States, eh? For some nice video shot by Ch. 17 Producer Tuija Lindell go here. Peter again shows his tendency to be nothing more than a star-****er. What does Chelsea have to do with anything? Not a damn thing. This isn't a public service announcement, it's a blog. If you don't like it, don't read it. Peter doesn't deserve any criticism for what he chooses to blog. "Peter doesn't deserve any criticism for what he chooses to blog." If you don't want to be criticized then it shouldn't be made public. "I think she’s capable. I think she’s more capable that Barack. She has the experience and the strength to deal with our country and other countries." I actually agree in that I think she is more capable then Barack and that she has what it takes to deal with other countries. I don't however think she has what it takes to deal with ours. What neither Obama or Clinton seem to understand is what we can afford. They talk the usual points up, universal health care, creating this program creating that program, but the hard reality is we can't afford all of this. This country is headed into a recession and spending on social programs isn't going to cut it. The only spending considered should be on infrastructure. Sure all these programs would be nice, but I am going to back the person that steps into reality ans says this is what we can afford, not what we want. I'd love to have steak and lobster every night for dinner, but alas, hot dogs on the menu tonight. Re: Watcher’s post: I think that someone who publishes a blog on the Internet is, by necessity, writing to the public (unless it is a private site, which this isn't), and is therefore subject to hearing the public's reaction. I disagree with the Watcher’s view that Chelsea's visit to Vermont isn't newsworthy, but generally speaking the particular choice of topic that a public blogger (Peter) chooses to write about on any given day *is* a fair subject of reaction/discussion by his/her readers. It's perfectly fair to say, "I don't think this is newsworthy." I think this is especially true when the blogger is a public commentator by profession. Watcher has a right to express his opinion (albeit civilly) on whether a given topic is or is not worthy of a blog posting by Peter. Otherwise, what is the point of a blog? (Also, it really doesn’t make sense to say “If you don't like it, don't read it.”) In this particular case, I think Watcher is wrong about the newsworthiness of Chelsea’s visit, and should have been more restrained in his expression. Just my two cents. "This country is headed into a recession and spending on social programs isn't going to cut it." ..For every dollar that is invested in Vermont's colleges and university, $1.37 goes into its prisons, according to the Pew report. any reason why you didn't cover the UVM event? We had about 500 people in the Davis Center with people on the balconies and on the rails and on the stairwell. Chelsea did a fantastric job speaking for her Mom and making the case for her candidacy. She won me over. Jake, I think you misread the article. The article points out that we spend more on corrections then on education but says nothing about the primary "drains" on the federal economy. Concerning the federal economy a recent audit of medicare/medicaid in three states showed 250 million worth of overcharging.....in THREE states. I think talking about universal health care is a bit premature since we clearly can't run what we have now. Also keep in mind that state gives the least or second least to education in the country so it really isn't surprising to me. As for comparing VT to the nation I think it is more prudent to compare educational spending per person and corrections per person. The number of the people in a state are after all the driving forces between the two. But back to your point....when we spend 250 million more then what is actually owed to just three states on medicare/medicaid alone I think you have to consider social programs to be a significant drain on the country. The war in Iraq has cost us hundreds of billions of dollars and that is a much more significant drain on the country. Of course, the war in Iraq is so we could go after al-Qaeda. Ooops, sorry those pathetic excuses for people were in Saudi Arabia and Afghanistan. It's nice to live in an alternate reality where social programs are the reason for all our ills and drained budgets. If only it were so simple. RealityCheck makes a good point albeit a predictable one. The war is costing us a great deal of money, as has every war in the past. Hopefully with a continued significant presence and stepping up pressure in Iraq to stabilize themselves we can withdraw in the near future. But that "reality" is that the war in Iraq is going to go on for as long as it takes regardless of who is the president. Clinton contines to fund the war, Obama continues to skirt the war and McCain is the only one that recognizes that stepping up our presence in the short term will get us out quicker. Now, one thing that RC doesn't figure is that while our conutry is spending all this money on the war, it is buying goods that are produced in this country and that creates or at least maintain jobs. Ergo the war is actually beneficial for our economy. THe greatest economic upswings have been during and following wars. that money to people and back into the economy. "It's nice to live in an alternate reality where social programs are the reason for all our ills and drained budgets." Of course in that alternate reality apparently you can make stuff up, pretend that somebody said something, and devalue the importance of the original point. See, I NEVER said that social programs were responsible for all the ills. In fact I agree very much with some of them or at least the ideal they were started on. I simply said we can not afford any new ones, at the very least with out cutting a current one. It's basic math. I'm surprised a bit at JPC here. He or she seems smarter than this post. "THe greatest economic upswings have been during and following wars." The "economic upswing" is due to the money that is BORROWED. I can have a great personal upswing if I borrowed ten thousand dollars and spent it this year on better food but the only net result is that I would be fatter and deeper in debt. The worst way we can spend money is on wars. It has the smallest beneficial multiplier of just about any spending. Think about it. If the two or three trillion dollars that this war is and will cost us was spent on economic development stimulus, education and infrastructure our international competitiveness would soar. Instead we buy bombs, tanks, etc., we pull employees out of businesses and send them overseas as National Guard deployments etc....... I could go on and on and on and on.... but I won't. You already have my rant d'jour. "If the two or three trillion dollars that this war is and will cost us was spent on economic development stimulus, education and infrastructure our international competitiveness would soar." When we speak of the money being spent on war have we ever considered where the billions we are spending is actually going? Stop and think of where it's spent. I would bet that when we look at the salaries paid to military personel it's paid to Americans and to their families and they spend the money in the US... helping the economy. When we buy munitions we buy from American companies....think of the last time you heard of us buying anything for our military from another country. All this money spent on weapons is going into our economy. Now I realize that non of us like spending money on war, but to say it's hurting our economy I'm not so sure. I would bet that 95% of the billions that we are spending is spent right in this country. Even Senator Leahy, who claims he is against the war, brags when he can bring war money home to Vermont industry. Hard to believe I am hearing the kind of things being posted here. Let's take an example. The program to procure new fighter jets was reported a week ago to cost 300 billion dollars. That is by the way, 300,000 million dollars. Of course, that is just the beginning. There will be the typical cost overruns, etc. etc. That's about a half a million dollars for every man woman and child in Vermont, and this is just one type of plane. The military uses many types including the contract just let to buy tanker planes from France (please note this "a democrat"). I don't have this info on my fingertips but I have heard the multipliers from different types of spending. Military is about the worst. Most things you spend money on generates other spending in the economy and creates a useful product that can help with many societal benefits as well as providing for a better business climate and more jobs. Military spending does none of this. The 1200 planes to be bought with the 300B do not house people (except for 1200 pilots part time). They have no use except to fight wars and protect the country. If we find a better way of resolving disputes these items are useless for any other purpose. As far as protecting our country goes, on 9-11 we managed to scramble two planes to deal with the remaining hijacked jet. And they flew in the wrong direction. Ugh. PJ, the planes we are buying from France are an unusual purchase. Most of the planes and other weapons are built in this country. I agree with you, as I said in the earlier post, none of us like spending money on war. The fact is many Americans are benefiting from the war. I believe the local GE plant has multimillion dollar helicoptor contracts. The plant in Vergennes..General Dynamics?...has built fuel monitoring systems for planes for over 10 years. And there are other military suppliers scattered throughout the State...ie..socks, helmets, gloves, etc. I believe the money from these workers does have a multiplier effect. If we believe the supporters of Burlington's Moran Generating Plant renewal that money has a 3.5 multiplying effect. A GE worker brings home $500. He spends some at the grocery store. The grocery store owner pays his workers they go out and spend, etc..
As I said earlier, I don't like spending money on war any more than the next person, but for people to keep saying that the billions are just being flushed down a sewer without any benefits is just not fact. This money is in circulation and widely in circulation in the Vermont area. If we are employed in this area or live in this area we, like it or not, are probably benefiting economically from the war. That might be true in the short-term. But in the long term, the record deficits and the tanking US dollar put our ecconomy in a terrible place. Arealdem, Every poster has commented that war is not an ideal way to stimulate the economy, just that their economical benefits as opposed to a drain. "But in the long term, the record deficits and the tanking US dollar put our ecconomy in a terrible place." Precisely, which is why we can't have Hillary giving 5K bonds out to every child and we can not afford universal health care right now. The Iraq war isn't going to end soon no matter which candidate is elected, so with the deficit we are currently running, we haven't any room for more spending. The tanking dollar is a result of the housing market....not the war. #1) We should get out of Iraq now and use the money on universal healthcare. #2) The dollar tanked LONG before the housing crisis. I wouldn't sweat the tanking dollar. It should have a long range beneficial effect. When Hondas and Subarus cost $50,000 because of our devalued dollar, the 50+% of Vermonters who are driving foreign cars will have to buy US cars. The same could be the case for every foreign product that we buy. #1.) No we shouldn't and won't regardless. We are not leaving Iraq anytime soon. Accept it and move on. Providing health care is NOT a function of government, we can't afford it, and we can't even keep medicare/medicaid on track. 250 million in overcharging in three states. That's only for a subset of the population, How much waste would there be for 50 states for the entire population? #1) McCain wants to stay in Iraq for 100 years. We can't afford that. Barack Obama will get combat troops out if Iraq by 2010. Accept it and move on. #2) America's healthcare problems aren't going away. Accept it and do something about it. #3) The dollar tanked because GW Bush got us into a war that we can't afford. We borrowed too much money. It tanked long before the housing crisis started. #4) To "a democrat" -- The Ford that you drive is made from Chinese steel and Mexican components. The devalued US dollar means "domestic" cars will increase in price along with the "imports".